Got a lot of blackberries? 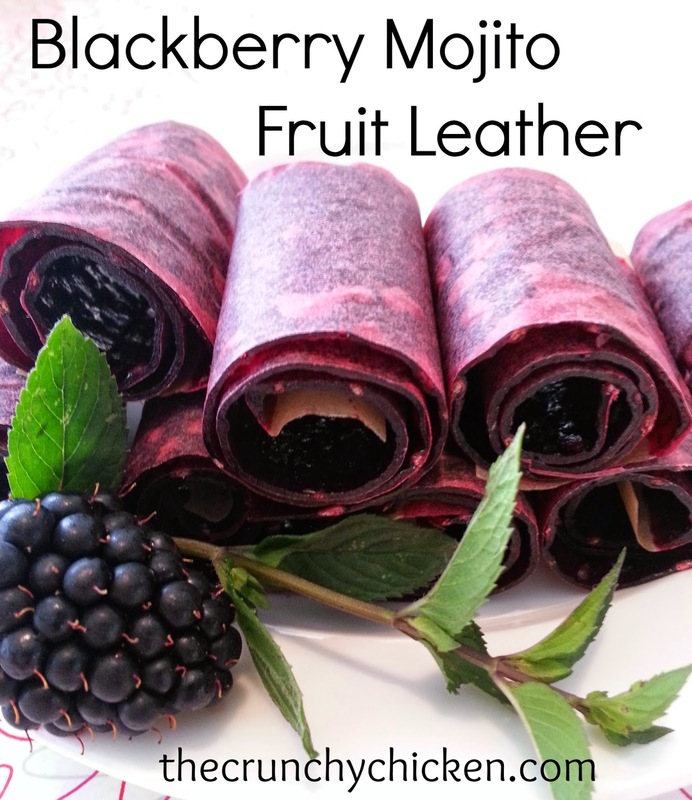 Then check out this recipe for Blackberry Mojito Fruit Leather. I'm not a huge fan of fruit leathers, but this turned out super good! And, really, you can't go wrong with blackberries, mint and rum. On Saturday, the New York Times ran an article, Chasing Utopia, Family Imagines No Possessions, that warmed the cockles of my heart. It covered several families who are downshifting to a life less harried and one focusing more on self-sufficiency rather than consumerism. In essence, the families, whether they intentionally are or not, are following the basic tenets of the Voluntary Simplicity movement. One family you may already know about. It is Matt and Sara Janssen - she writes the eco blog, Walk Slowly, Live Wildly, which I read from time to time. They have completely sold most of their worldly possessions and are travelling the country in a used veggie oil fueled motor home, teaching others how to convert their diesel vehicles into a spent fast-food grease machine. The Live Lightly Tour is quite an exciting adventure and one which I've been following closely. Another family has sold all their possessions as well and is planning on moving from Austin, Texas to a rural area of Vermont. They are currently looking into purchasing a log cabin and hope to set up a homestead, grow their own food and homeschool their kids. In other words, the classic "back to the land" scenario. For those of you who participated in my post last week about living out your wildest dream, you may be interested in reading this article. Of course, this is just begging for a poll. I'm throwing in one other example, the Dervaes family in Pasadena who practice the ultimate in urban homesteading, making phenomenal use of their suburban lot to grow a tremendous amount of fruits and vegetables (6,000 pounds annually), raise bees, goats, chickens and whatnot. If you've been living under a rock and haven't heard of them yet, I urge you to check out their website. One of our favorite yard sales ever was the one where the family was selling off almost everything they owned. They had a camper van and planned to spend a year (or more) touring Europe and home-schooling their kids. We bought more than we needed. 'Course these days, I'd be more inclined to help someone trying to finance a more sustainable lifestyle, but we still appreciated that they were following their dreams. A few years ago I took a month long trip in an RV touring the western US. It was one of my absolute top favorite vacations. What an adventure! Hmm, the poll question is a hard call. I did the rural off-grid thing once. Because we were poor as churchmice and couldn't afford things like solar, we just did without electricity and running water. It was delightful. However, I think our carbon footprint was actually larger than it would be in the right urban setting. We heated with wood. We had to drive to work (and work to pay off the land) and that was more driving than I currently do in the 'burbs. And, having moved about five degrees latitude south, fruit trees grow much better here! I'm trying to do the last one now...why wait?? What do people do about health insurance? That is my biggest concern. I would fall off the edgeof world if it weren't for that. So can someone explain what to do about that? Thank you! I wish we could get off the grid. But solar pannels are still to pricey for us. With gas prices up agian we are staying home this summer and making use of the property we own to "camp". We spent the last month clearing a couple different places on our property to put the camper and will rotate locations. We have expanded our gardens so we can grow more of our own food. Have a feeling it's going to be a great summer even if we don't get off the property except for work and supplies. I had been reading on the Live Lightly Tour, but hadn't hear of the others. Thanks, Crunchy! That will make good lunch hour reading for me. Now... onto the poll. I so desperately wanted to vote for the sailboat. My hubby even took sailing in college, but I just couldn't. I get green-faced, over the rail, uncontrollable retching on the open seas! That is NOT fun, so I voted for the RV. I would love to take my boys on an adventure like that! My sister got married in Italy and we took all 3 (there were only 3 at the time, the 4th hadn't arrived yet!) on a 10 day driving adventure throughout the entire country when they were ages 7-9 and it was AMAZING. If we could afford it, I would sell everything but the dogs and get on the road! Driving home from the central coast last weekend, where I was visiting my sister, we passed the RV (the Live Lightly Tour). It did look like quite the life! I want to do what Growing Power is doing in Milwaukee - farm in the city, and reach out in the community. I think i'm just not a rural, self-sufficient girl. I like the city buses and the busy parks and sidewalks, and the liveliness. When I stayed with the hippies, I kept having to recharge my lantern batteries because I just can't go to bed when it gets dark. And I don't know that I ever want to live outside of pizza delivery range ever again. I'd prefer to farm a suburban lot, because I can't drive and am a bit of an introvert. If I lived out in the country, I would *stay* out in the country and have no social life at all. This would not be healthy. I have never had any dream of selling everything and buying a van to live in or anything like that. I must admit I like my house. If anything, I would suppose I would like to do like the dervae's. I have a video on them. I really like her blender! I just can't quite get past the thought that I might take to eating my offspring if I were trapped on a boat with twin 4 year olds. I tried to convince Mr. Greenjeans to go off with me in a school bus before kids came along but he's a homebody. Hey Rob, the Vortex blender is not that expensive. It's listed on the manufacturer's website for, I think, $69.99, but we found it for $20 less at a store. It works pretty well, although it doesn't do so great with thicker mixtures. And I've been hesitant to try my favorite pancake recipe with it because I think the wheat berries would scratch the heck out of the plastic. Yeah, that's another downside: it's plastic! The bottom of the blender that screws into the base is thin so I don't think glass would be an option. I'd love to have a bike-powered blender but can't justify the cost. Hm, I could stimulate the economy... nah, that much money would buy a lot of seeds, garden supplies, or food! I've lived out of an RV for forest research work and LOVED it. The most likely option to happen is to live in the urban option, producing as much of my own food as possible. The Dervaes are attempting to push the limits of their production to 10,000 pounds this year. It's exciting to see how well they'll fare ;). We're working on the suburban homesteading. I'm no where near the Dervaes, but I figure they've got, something like, fifteen years of practice/experience on me. Maybe my kids will be like they are in fifteen years ;). thanks for linking to that article. i look forward to checking it out. i voted for the 2nd option, but i don't know if the extreme isolation would get to me. I would definately go for RV'ing..we are already doing the rural thing-growing our own fruits and veggies, trying to live a pretty simple life. I also don't drive and we live 20 miles from town...it's not as bad as I thought it would be...I keep in close touch with folks I know and have gotten to know the nieghbors well. We do alot of trading offof services between a group of us out here so life isn't as isolating as one would think. Besides there is more than enough work around the property yo keep one busy. My bf has the plans for a Prime Mover to power his laptop, but it's not built yet. We spend a lot of time discussion non-electrical bike power for rotary appliances (grain mill, laundry spinner, blender) but so far I see lots of crazy superman bikes and tall bikes and four-wheeled bike cars, but no useful kitchen appliances. He says: "Every morning, I pedal to generate electricity. The Pedal Generator I ride charges batteries, that run an inverter, that produces 110v AC, that powers LED lights, the monitor on my computer, my cell phones, and many other small battery-powered things. It is the most inspiring workout you can imagine." S soon as I stop chasing my newly crawling 8 month old, I will be checking out some of these links. I'm in awe of people who can just pick up and go like that. Thanks for the link to the Dervaes' site. Their set-up is inspiring... I have a similar plot of land (well, with less land to grow on) and live in the big city. This type of living would be my dream! I planted a few tomatoes this year, seeded them too late, and they're barely hanging on, so clearly I have a long way to go! Thanks for the great links and conversation, Crunchy. Couple that with the price of fuel - bio or reg diesel or gas. We would be sitting at one site for a while. Thanks, Rosa. I went back and checked my post on pedal power and I did link to David. We do have a wringer washer but it's not set up on the bike yet. Thanks, Rob, for the Dervaes link. I'm looking again at how to unplug my kitchen even more! I hadn't read your pedal power post, Chile. Now I have, I'm jealous. That is an awesome setup for the flour mill. One of the great things about a simple life is that it may be lived anywhere, including where we all are right now. I think the Dervaes family are national heroes. I love the idea of RVing, but not for extended periods of time. I do like having roots. I voted for the rural setting, but I'm not really all-out about it. I want to be close to a decent sized town and I like my dishwasher and clothes dryer. I do want to grow my own food though, have lots of animals, and just live alot closer to nature. Oh, and there is a term for the RVing lifestyle when you have kids. It's called Roadschooling. Google it and you'll find families doing just that. Got a burning question? Email me! Is McCain green or brown? Reporting in for duty, sir! Green Book Week - winners list! Would you like to receive each new Crunchy Chicken post via your email? Read Crunchy on Mother Earth News! Real People. Real Makeovers. Real Impact. © Copyright 2007-2011, The Crunchy Chicken | Deanna Duke. All Rights Reserved. Powered by Blogger.